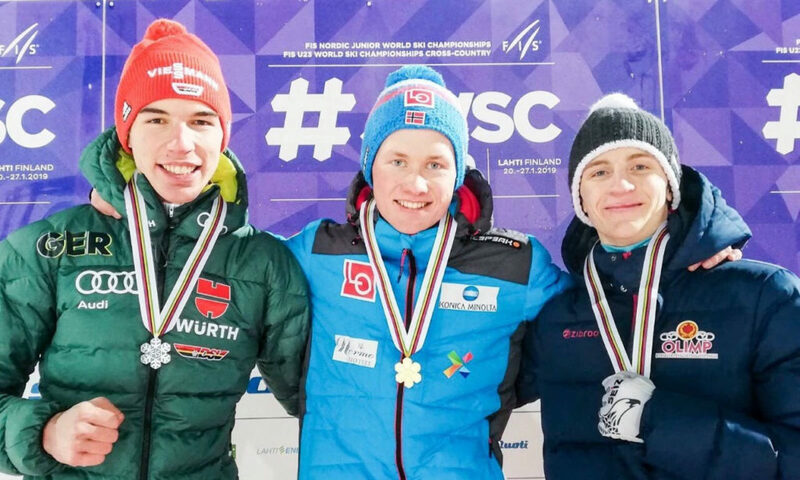 ASTANA – Kazakh ski jumper Sergey Tkachenko won a bronze medal at the recent 2019 Nordic Junior World Ski Championships in Lahti, Finland, reports the Kazakh National Olympic Committee. Sergey Tkachenko (far right) and ski jumpers. Photo credit: olympic.kz. On Jan. 19-27, athletes competed in 23 events at what were the 42nd Junior World Championships and the 14th Under-23 World Championships in Nordic skiing. In the men’s junior event for the individual normal hill, Norwegian ski jumper Thomas Markeng earned first place with 252.1 points, German ski jumper Luca Roth earned second place with 250.8 points and Tkachenko earned third place with 248.9 points. Pavel Vasilyev, the Kazakh national team’s head coach, noted the Kazakh athlete’s achievement was historic. “For the first time in the history of independent Kazakhstan, we have a Junior World Championships medal,” he said. Nineteen-year-old Tkachenko was born in Ridder and began skiing at age twelve. In 2017, Tkachenko was the Asian Winter Games bronze medallist and won silver at the team event. He competed in two events at the 2018 PyeongChang Winter Olympics. In July, he set the summer world record distance at 151 metres at the opening event of Burabai Ski Resort in Shchuchinsk. Along with Tkachenko, ski jumpers Nikita Devyatkin, Gleb Safonov and Nurshat Tursunzhanov represented Kazakhstan at the sports event. The national team earned an expanded quota this year, with twice as many athletes competing at the championships for the first time. Also, for the first time, Kazakhstan was selected to compete in the team events with 12 other teams.